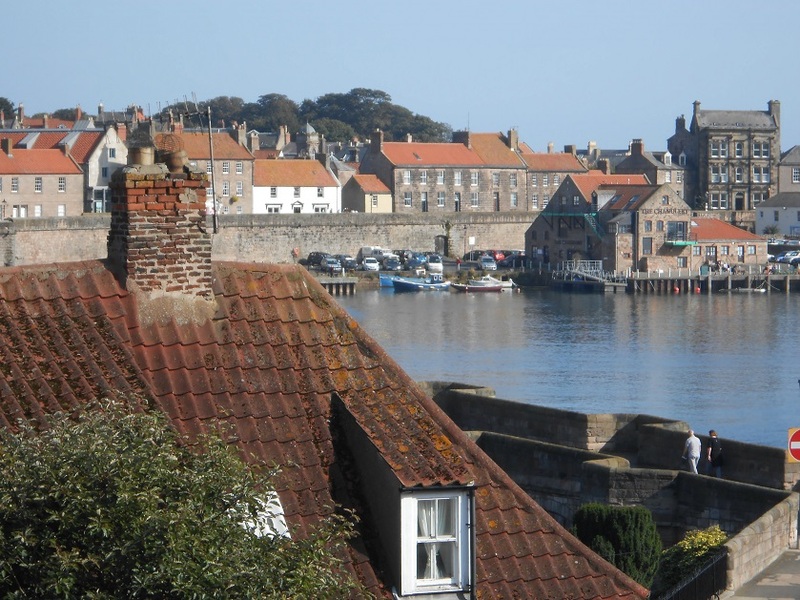 I include as part of the Scotland experience our one-night stay in Berwick-Upon-Tweed, because the town lies on the England/Scotland border and up until 1482, when England took it for good, it changed hands between the two countries numerous times. I gather it was a point of contention simply because it was on the border—and because it had a nice, strategic harbor. The last ship built at Berwick was the Audela, launched in 1979, which is now remembered in the name of a restaurant, at which we ate. 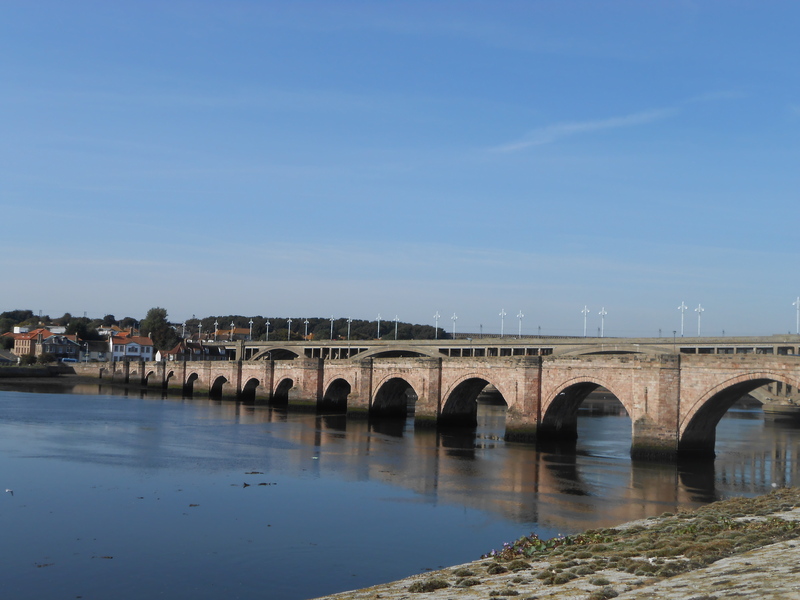 Berwick (pronounced “Barrack”) is known for the thick accent of its natives, classified by folks just north of the town as having solid English elements and by folks living south of the town as being laced with Scottish sounds. The taxi driver who drove us from the railroad station to our hotel and then back again the next morning had a nice version of the accent—though we were speaking the same language, it was a struggle to catch everything he was saying as he gave us a mini-lecture about the sights around his town. We don’t have many photos from this 24-hour stay for some reason. The two below are of the Old Bridge and the Quayside. Our B&B was one of the buildings on the wall. The best thing about the town is being able to walk completely around it on the old town wall, experiencing its many phases as a town defense from the medieval to the Elizabethan to the World Wars. 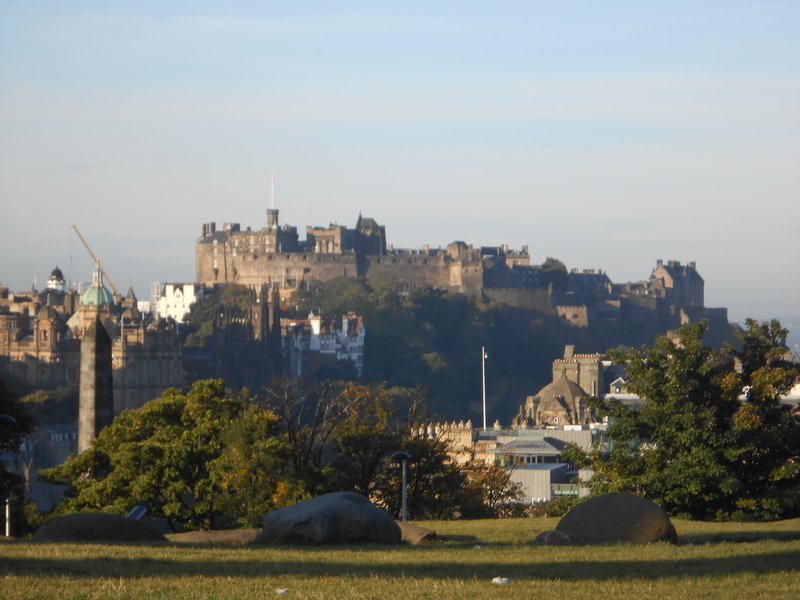 Then–Edinburgh! All reports we had before we left on the trip were that Edinburgh is a beautiful city, and we confirm those reports. Our hotel was on Grassmarket Street, a great base for exploration, although on our first attempt to make it to the Royal Mile, we took a wrong turn and ended up at Greyfriar’s Kirk instead. A good mistake, because on duty at the Kirk was a docent who was delighted to hear that we were from Indiana, the birthplace of Eleanor Stackhouse Atkinson, the American author who wrote the classic children’s book that became the basis for two films about the loyal little dog, Greyfriar’s Bobby. The docent gave us an impromptu private tour that explained the true story, as well as one can define truth in a 100-year-old legend. The graveyard at Greyfriar’s Kirk introduced us to the intriguing style of vaulted tombs, which are walk-in room-size constructions, some highly ornate. At various turbulent times in the country, this type of tomb was used for jail cells. Much walking in the town over three days took us up and down the Royal Mile—yes, we finally found it—and past most of the major landmarks. Holyrood Palace is beautiful, but the tour was so expensive we just observed it from outside the gates, firmly turning our backs on the hideous 20th-century Scottish Parliament building across the street. We visited St. Giles and St. Cuthbert churches as well as the Canongate graveyard. The Calton Graveyard is also beautiful: the tomb of David Hume was interesting to me (as a former student of philosophy), and we were fascinated to find Abraham Lincoln atop the Scottish-American Monument commemorating the Scots who fought in the American Civil War. On the second day in Edinburgh, we caught a shuttle bus to the Glenkinchie Distillery 30 minutes outside of town in order to experience close up the making of Scotch in Scotland. Bob enjoyed the tastings, and we both enjoyed the serenity of the site in addition to the tour. Noteworthy about that day was that since we were staying in a hotel and not a B&B, we had to find our own breakfast, which we did at Starbucks (the only time we ate non-native) and a local pastry shop. If Bob was after the Scotch, British pastries were my target for the trip! The next morning we found an even better French pastry shop with beautiful apple tarts—I defy anyone to find a better cream filling than in that tart! In the Princess Street Gardens, we encountered the Sir Walter Scott memorial, which I climbed right up to the claustrophobic top. Fantastic, if vertiginous, views of the city! Outside Edinburgh Castle we watched a fully armed and appropriately costumed blue-faced Highlander ala Braveheart, who accosted tourists by saying, “Are you ready to die!” After the victim was sufficiently intimidated, the actor pointed to his blue face and clarified, “Are you ready to dye?” Haha. We saved the Edinburgh Castle for the last day and thoroughly enjoyed the nearly four hours we spent there. In addition to the beautiful buildings of the castle and the stunning views from the ramparts, we went through two of its military museums and the museum containing Scotland’s crown jewels. To conclude, our short trip to Scotland, more than just being an item checked off my list, confirmed our suspicion that seeing Edinburgh is not enough. Bob and I agree that visiting more of this beautiful country must be added to our future travel list. More photos from the Scotland portion of our trip are found on my Facebook community page, Out of Work Editor. Previous Article Previous Article: Bloody Romans!